One of the great natural wonders of the world and a UNESCO World Heritage Site, Halong Bay covers an area of 1,500 km over which are scattered thousands of limestone islands and grottoes rising from the clear, emerald waters. The only way to really appreciate Halong Bay's natural beauty is on an overnight cruise. Be transported back to the old times, charm and luxury of Indochina's Emeraude Classic Cruises, with all the comforts and personal service you could possibly wish for. Sail the mysterious Halong Bay in a deluxe 55 meters vessel that has been designed in the tradition of Le Tonkin. Cruise among hundreds of islets to discover unspoilt pockets of Halong Bay and its remote, floating fishing villages. Kayak or swim from the vessel’s stern deck. 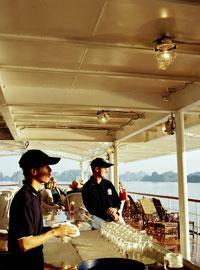 At the Hang Trong anchorage, whet your appetite with an onboard cooking demonstration. After sunset, enjoy dinner at the restaurant, before retiring to your cabin for a good night sleep or join the crew and learn squid fishing. Wake up the next morning at sunrise, practice Tai Chi on the sundeck, feel the early morning salt water scent; bask in the early sun rising from behind the mountains. After an American buffet breakfast, check out at around 09:30 am and disembark at Emeraude Pier. Arrive back to Hanoi by noon. The Emeraude offers 38 cabins meticulously designed to evoke the nostalgic charm of colonial Indochina.With polished wooden floors and brass fixtures and fittings the Emeraude's cabins offer timeless elegance while the restaurant offers delicious, freshly caught local seafood and the flavours of traditional Indochinese fare.